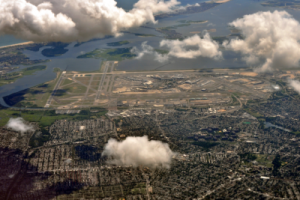 New York John F. Kennedy Airport (IATA abbreviation: JFK) is the largest of the three airports in the New York area, Newark Liberty International Airport and LaGuardia Airport. It is also the largest of the three (53 million passengers in 2014). It is the most international airport in the United States and gateway to the uncrowned capital of the world. The airport consists of nine separate terminals which are located in a U-shaped arc around the central airport facilities. The AirTrain connects the terminals together. There are several daily flights with KLM and Delta Air Lines to New York JFK Airport.